While You Wait Hydraulic Hoses. We can manufacture Hydra ulic Hose assemblies to your patterns or description. We keep large stocks which help us to achieve a fast turn around. Goodridge Stainless Steel over braided Brake Hoses to patterns or description. Rigid brake pipes in kunifer. Rubber and silicone radiator hose. Rubber and overbraided fuel hose. 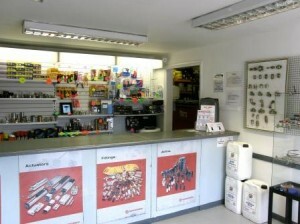 Earls and Goodridge Oil & Cooling Hose and fittings. We can rebuild most Power Steering Hoses re-utilising the original steel ends. Currently we cannot make Diesel Injector pipes. Boat Hoses. Sea and Inland Waterway Boats. We can supply fuel hoses to the EN ISO 7840 A1 standard, which are a requirement of the Boat Safety Scheme. Fuel Filler hoses and Wet Exhaust Hose. Propane Gas hose to BS 3212. Water hose for Bilge and Cockpit drains. Hot and Cold water hose. Sanitation hose with low odor permeation characteristics. A large range of Mild and Stainless Steel clips and clamps.